First of all, HAPPY NEW YEAR!! Hope those wine headaches are minimal on this fine first day of the 2012… I’m excited that my first Divine Wine Sunday post is on the January 1st! So – as a Wino, I do have a general idea of what kinds of wine I like to drink – it is pretty rare that I am unsatisfied with a glass or bottle that I end up with at a restaurant or wine bar… perhaps I’m lucky in my selecting of wines, or perhaps my palate isn’t developed enough to know when what I’m drinking is bad, or perhaps I just stick to what I know I like. Usually, the only glasses I choose not to finish (or even give back) are those in a slow hotel bar that opts to serve its patrons a glass of wine out of a bottle that was opened two days prior. Anyway, one thing that is for certain is that if there is a Cabernet Franc on the menu, that is typically my first choice. This isn’t necessarily because I have loved every Cab Franc I’ve ever had. But (a) they typically have characteristics that I enjoy in a big wine – dry and earthy with a smooth finish, (b) a Cab Franc wine (i.e. – one that isn’t blended with other grapes or at least not blended much with other grapes) isn’t all that common (from what I’ve seen), and (c) you don’t often see Cab Francs available in restaurants / wine menus. As a wine, the books say that Cab Franc is typically light to medium bodied and sometimes includes herbaceous aromas. 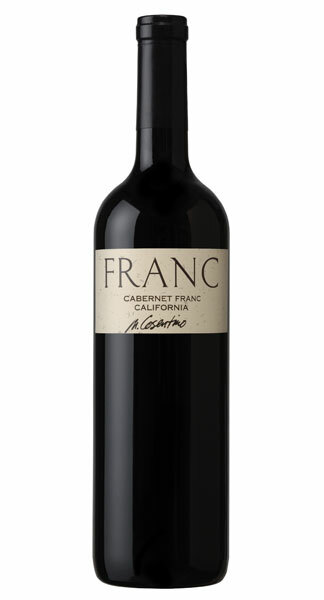 Huh… I would have thought Cab Franc would be described as medium to heavy, but I suppose I related the “boldness” of a wine more to its earthy factor than its fruity factor. So my judgement (as noted in “Wino Assessment” above) was not too far off (I did write that before reading anything else…). Plum, smooth finish… it’s just that light to medium bodied thing threw me off. Italy: It is also fairly common in the north east regions of Italy, but not nearly as much as Cab Sauvignon. Italians may refer to Cab Franc as “Cabernet Frank” or “Bordo”. It is also increasingly being referred to as “Carmenere” in north east Italy. The U.S. of A.: Cab Franc has been grown in Cali since the 1960s (way old, dude) and is primarily grown in the Napa and Sonoma counties. The book says that it is becoming “increasingly fashionable” due to its relative scarcity (did you hear that – I’m part of an increasingly fashionable crowd!). Besides Cali, it is also grown in Washington State, Pennsylvania, Virginia, and New York. So there you have it – the first Divine Wine on Wino to Wine Know. I feel like I Wine Know a little more than I did… do you?? Thanks for the information! I’ve enjoyed this wine as well, per your recommendation. I’m impressed with Wino’s assessment, using words like “plummy” and “chalky.” I probably only could have described it as “mmmmmmm.” Looking forward to more Divine recommendations from you! agreed, very interesting reading. I felt like I could taste the wine while reading about it (bonus for me, yummy wine, no post-wine headache). And, now I know how to describe taht tannin flavor, “chalky”, perfect! Ha! I like the idea of just imagining drinking the wine and saving yourself from the potential headache. It reminds me of that scene in the movie, “Hook” with Robin Williams (as Peter Pan) and the kids all have the imagined feast in front of them and they get so full eating all the imagined food. that, not taht. but you knew that! Dang it! I tried this Cab Franc and this is the mysterious “quality” that I don’t like that I’ve been trying to describe to you for so long. It tastes almost buttery to me which I don’t care for in a white or a red. It’s weird though because I just had another cab franc that I really liked. Sigh.